Economic and financial integration efforts between the Mediterranean Partner (MPs) countries and the European Union (EU) were initially introduced by the Cooperation Agreements, which granted total exemption from tariffs on industrial products. These efforts were subsequently enhanced by the Association Agreements that were launched under the Barcelona declaration of 1995, which resulted in MPs reducing or even eliminating tariffs on European industrial imports. At the same time, MPs have opened up considerably to other countries, either under the framework of the EU-Mediterranean (MED) trade agreements, or in the context of widespread reduction in tariffs through the signing of the World Trade Organization (WTO) agreements. In early 2000, the Barcelona Process was replaced by the European Neighborhood Policy (ENP), which then was revised in 2015 and became the New European Neighborhood Policy. It is under this framework that the economic relations between the EU and their MPs are now being reshaped. The New European Neighborhood Policy provides a robust platform towards financial assistance through deeper financial integration, greater access to the common market, and better institutionalization of trade and financial relationships. The EU is also proposing a Deep and Comprehensive Free Trade Area (DCFTA) that will address agriculture, services, and non-tariff measures. Negotiations for the DCFTA are underway with Morocco and Tunisia. Within the context of this New European Neighborhood Policy and the role of the EU in facilitating the modernization, the transition, and international openness of the Mediterranean countries, this research study assesses the degree of income convergence between the two groups (EU and MED) resulting from those trade agreements, as well as macroeconomic volatility effects of those policies on a selected sample of MPs, in order to identify the winners/losers form these trade agreements. This said, in this study, we use in a first stage the concepts of s-convergence and b-convergence to evaluate empirically income convergence among a group of EU-MED countries over the period 1980-2015. We then present a thorough empirical analysis of the implications of the Euro-MED partnership agreements on economic growth and on macroeconomic volatility in a sample of MPs. Because of the initiation of the Barcelona Process and the Neighborhood Policy in 2000, the empirical analysis is carried out sequentially, over 5 and 10-year periods, and then for the period as a whole 1980-2015. The empirical findings show that there is weak evidence of income convergence for a group of EU-MED countries when analyzed in 5- or 10-year subintervals from 1980-2000 in single equation cross section regressions. However, we find statistically significant evidence of real per capita GDP convergence either when the whole sample period 1980-2015 is analyzed or when the 10-year sub-periods are pooled and estimated in panel growth regressions. These are more plausible results both because economic growth and convergence are long run phenomena and because panel methods deliver more efficient parameter estimates. For the period 1980-2000, there is evidence of weak conditional income convergence in the group of EU-MED (16) countries, and this evidence becomes much weaker for the MED group of countries in between 2000-2015. The reason for these results is the negative effects of the European financial and debt crises on the Euro-MED region in general, and on the MED region in particular. Macroeconomic stability and economic openness turned out to be statistically important factors and have the expected positive effect on economic growth in the MED countries. Indeed, in most of the estimated models, the variable that is consistently the most significant is economic openness. Of the other explanatory variables, population growth has the theoretically expected negative effect on economic growth as it is found in other studies on empirical growth. Government spending also had a negative effect on economic growth and is statistically significant as is population growth. Other empirical results point to the fact that MED countries may be less susceptible to EU’s financial shocks if the domestic MED market is larger and/or more regulated. This is consistent with what economic theory would suggest and it has policy implications. In reality, some MED countries have chosen to impose capital controls to deal with financial market crises since it appears that the “culprit” is international capital flows although this policy practice may have undesirable long-term economic consequences. We have shown that MED countries should improve their macroeconomic and financial policy coordination to cope effectively with the impact of greater trade and financial integration with the EU. This may be achieved for example through enhancing regional economic and financial integration. The establishment of a MED free trade zone will not only stimulate and enhance growth, but will also enhance intra-MED trade, thereby, reducing considerably the exposure to the EU’s business cycle, and controlling for the excessive exposure of these MED small open economies to macroeconomic developments in the EU. The literature shows that large economies can better absorb and neutralize the effects of external shocks. Controlling for the effects of shocks, however, is particularly more difficult in the case of the developing MED economies, which are smaller in size and nearly dependent on exports to the EU of very few commodities and on the import of a huge number of commodities. A direct consequence of an integrated capital market within the MED region will be to reduce the risks associated with greater EU-MED integration, and to dampen the vulnerability of MPs, especially those with high levels of debt, such as Lebanon, Jordan and Egypt, to the effects of fluctuations in EU’s interest rates. A larger MED financial market would lower the cost of raising capital, and would allow MED governments to service their huge debt at lower costs on one hand, and MED firms to rely more on the local market rather than tapping EU’s markets to raise capital, on the other. Lower costs of raising capital will subsequently translate into more investment, consumption, and GDP growth rates in the region. The MED region should accelerate the process of trade, financial, and economic integration with the EU in order to better absorb the negative effects of external political, financial and/or economic shocks. Efforts should also be exerted to speed up the implementation of the fiscal and monetary reforms so as to improve the inflow of portfolio and FDI into the region. In short, for further trade and financial integration with the EU, MPs need to individually devote more efforts to pursue sound macroeconomic policies. This should be coupled with institutional reforms aimed at developing the financial sector in the respective MED economies. Subsequently, MPs should try to integrate horizontally while at the same time opening up further vertically (to the EU). It was shown that financial openness- as measured by gross capital flows as a ratio to GDP- is associated with an increase in consumption volatility, contrary to the notions of improved international risk-sharing opportunities through financial integration. The inherently unstable macroeconomic environment, political and military turmoil, as well as unsound monetary and fiscal policies in the MED region may explain this empirical irregularity. One policy recommendation of the study is that MPs need to be more, not less, integrated with EU’s financial markets to be able to reap the benefits of financial integration in terms of improved risk sharing, and consumption smoothing opportunities. This conclusion will however require further analysis, as regional financial integration is associated with a variety of risks in the EU-MED region. To minimize these risks, MPs would need to implement sound macroeconomic and structural frameworks in tandem with further integration. For example, our findings have emphasized the role of sound fiscal and monetary policies in driving macroeconomic volatility. In regard to structural reforms, the development of the domestic financial sector is critical, as a high degree of financial sector development is associated with lower macroeconomic volatility. Finally, the New European Neighborhood Policy provides a robust framework towards trade and financial assistance through deeper financial integration, greater access to the common market and better institutionalization of trade and financial relationships between the MED and EU countries. This research project will assist policy makers and academics in the EU and MED regions in redefining their trade, financial and macroeconomic priorities while designing new European Neighborhood Policies that will respond to the recent economic challenges. The new European Neighborhood Policy will spawn a large amount of literature on its consequences. 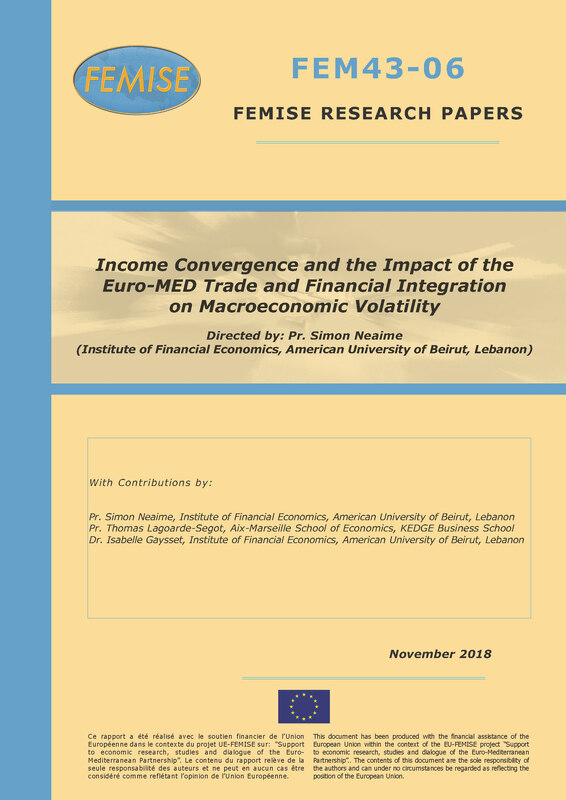 This study constitutes an integral part of that literature by identifying the common and differing strands of analysis with particular emphasis on the changes made in the macroeconomic policy paradigm in both the MED and EU region.